"Of the Bay" dockbar released. Asmosphere Dynamic assembler with SSE2 SSE3 SSE4 and 3DNOW. Here, you will find tools, libraries, controls, headers, examples and articles on Windows programming with the PowerBASIC™	compilers. Unless otherwise stated, all the code available to download is freeware. That means that you can use it for your own purposes, even in commercial applications, without paying a fee, but not to make derivative works from, sell or redistribute without permission. Also you must assume the entire risk of using it. The reference guides have been assembled using information found in the web, mainly from MSDN (Microsoft Developer Network), that has been adapted to the PowerBASIC™ syntax, so any rights over the contents belong to the authors of the original material. The source code, headers and libraries are available as attachments in the forum. To be able to download them, you must first register using your real, full name (nicknames, alias and handles aren't allowed), and provide a valid email address. A hearty thanks to Theo Gottwald for providing me space here for my site. PowerBASIC is a trademark of PowerBASIC, Inc. This is not an official PowerBASIC site and we are not affiliated with PowerBASIC, Inc. The TypeLib Browser is a tool that allows browsing and exploring type libraries and generate PowerBASIC compatible source code to use the components that they describe. Type libraries are binary files containing metadata that describe COM classes. 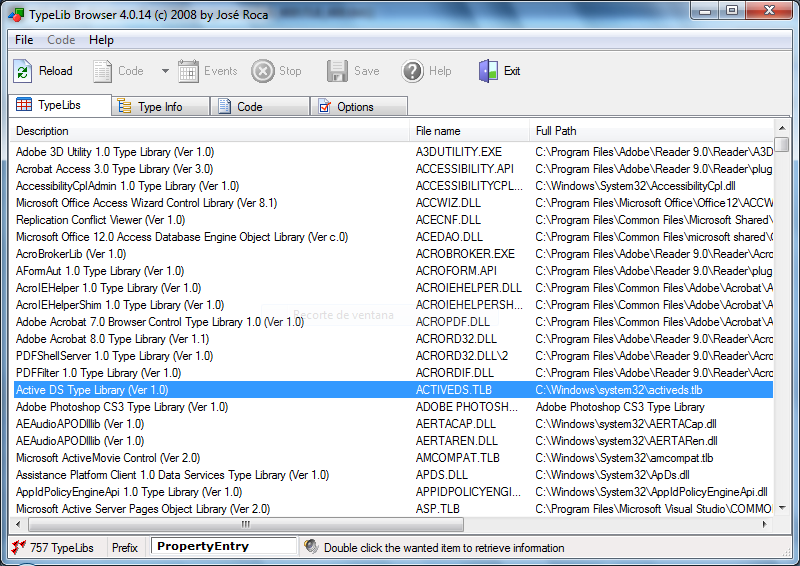 They can be supplied as a standalone file using the file name extension of TLB (Microsoft Office uses the extension OLB) or embedded as a resource in the associated DLL, EXE or OCX. PowerBASIC™ provides a similar tool, called PowerBASIC COM Browser, with their compilers, but the TypeLib Browser gives more information about the contents of the type libraries, which should be very useful to those interested in learning COM programming in deep, and has more options to customize the output of the generated code. 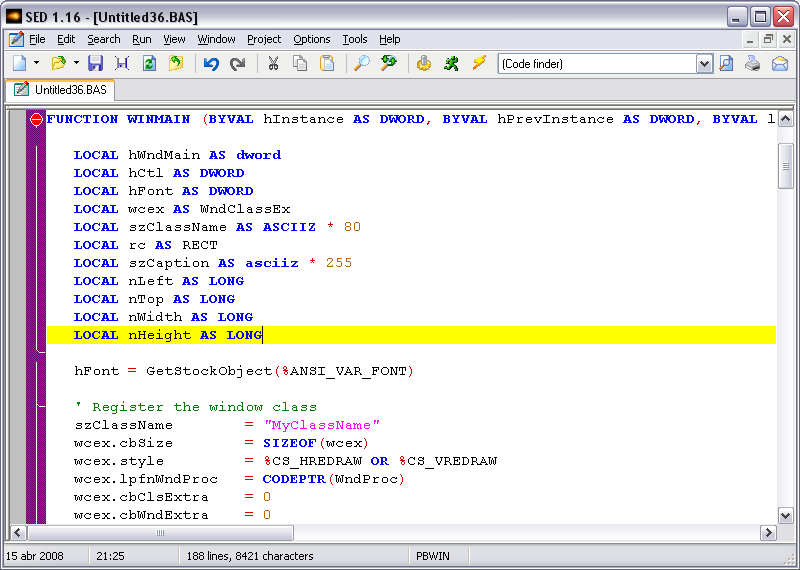 A programmer's editor for the PB/WIN and PB/CC compilers. It uses Scintilla as the editing component and features a tabbed MDI interface, syntax highlighting, codetips and autocompletion, block operations, unlimited undo and redo, drag and drop, code folding, bookmarks, zoom, project management, context help, customizable fonts and colors, split windows, color printing, code analyzer, and much more. To install it, just unzip SED_116.ZIP (3,598 Kb) in the folder of your choice. The download includes the full source code. This is a collective work made by members of the PowerBASIC community. His names and contributions are specified in the SED History page of the help file. All of them have agreed to donate his work for this project to the public domain, so there are no restrictions of his use unless otherwise stated. If you use the code for your own projects, please give us the due credit.